This version of the popular flickerfixer is designed for Amiga models with OCS and ECS and a socketed Denise chip (i.e. Amiga 500(+), Amiga 2000, Amiga 3000[T], CDTV). The Amiga 600 is also supported if an A603, A604 or A604n Memory Expansion is installed. All screenmodes are converted to frequencies of 60Hz or more (output optionally at 50 Hz to avoid tearing effects), and the S-Hires mode of the ECS chipset is displayed in full resolution. 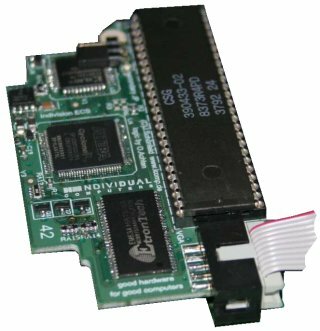 Indivision ECS can display the ECS screenmodes even on systems that only have an OCS Denise chip, the only requirement is an ECS Agnus chip (which is usually present in all Amiga models made in 1990 or later). Denise chip not included. Non-interlaced modes can be 'downgraded' with the built-in scanline emulation to achieve the warm and fuzzy retro feeling your 1084 monitor provided back in the day. :-) Another novelty is the built-in Graffiti emulation. Software that makes use of the Graffiti modes can display 256 out of 4096 colours without HAM artefacts. The left picture shows two Indivision ECS prototypes stacked upon each other. This is not only a good way to save space, it actually serves a purpose: When using two Indivision ECS, your Amiga is able to run a dual-screen setup, so it can have two separate screens showing their own independent picture (i.e. different output on both screens, not one screen cloned on the other)! Work on a driver allowing to spread the Workbench over two displays has been started. We recommend 2 MB ChipMem to get the most out of Indivision ECS. If you own an Amiga 500, Amiga 2000 or CDTV, the Mini Megi Chip is an easy option to upgrade your ChipMem to 2 MB. A603, A604 or A604n Memory Expansion required for operation. Space constraints require that the floppy drive be removed if the Indivision ECS is used with an A603 card. 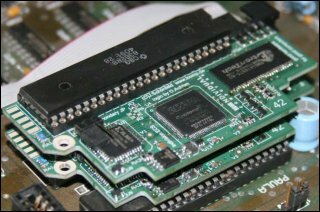 To avoid short circuits, the metal shield must either be cut or removed entirely (most Amiga 600 computers were delivered without the shield in the first place, so this is a minor issue). Can't be used together with an Apollo accelerator card. Due to space constraints, the battery clock must either be moved or removed. Indivision ECS needs at least two additional sockets. The video slot is partially covered, there could be space problems with a long Zorro card in the upper slot. Due to space constraints, one electrolytic capacitor must either be moved or replaced by a flatter version. Adapter required since the power supply is in the way (adapter available separately).